The community assembly rules and species coexistence have always been interested by ecologists. The community phylogenetic structure is the consequence of the interaction process between the organisms and the abiotic environment and has been used to explain the relative impact of abiotic and biotic factors on species co-existence. In recent years, grassland degradation and biodiversity loss have become increasingly severe on the Mongolian Plateau, while the drivers for these changes are not clearly explored, especially whether climate change is a main factor is debated in academia. 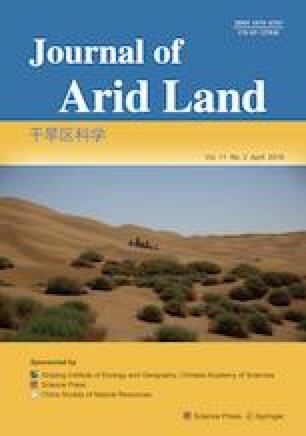 In this study, we examined the phylogenetic structure of grassland communities along five transects of climate aridity on the Mongolian Plateau, and analyzed their relations with environmental factors, with the aims to understand the formation mechanism of the grassland communities and the role of climatic factors. We surveyed grassland communities at 81 sites along the five transects, and calculated their net relatedness index (NRI) at two different quadrat scales (small scale of 1 m2 and large scale of 5 m2) to characterize the community phylogenetic structure and analyze its relationship with the key 11 environmental factors. We also calculated the generalized UniFrac distance (GUniFrac) among the grassland communities to quantify the influence of spatial distance and environmental distance on the phylogenetic β diversity. The results indicated that plant community survey using the large scale quadrat contained sufficient species to represent community compositions. The community phylogenetic structure of grasslands was significantly overdispersed at both the small and large scales, and the degree of overdispersion was greater at the large scale than at the small scale, suggesting that competitive exclusion instead of habitat filtering played a major role in determination of community composition. Altitude was the main factor affecting the community phylogenetic structure, whereas climatic factors, such as precipitation and temperature, had limited influence. The principal component analysis of the 11 environmental factors revealed that 94.04% of their variation was accounted by the first four principal components. Moreover only 14.29% and 23.26% of the variation in community phylogenetic structure were explained by the first four principal components at the small and large scales, respectively. Phylogenetic β diversity was slightly significantly correlated with both spatial distance and environmental distance, however, environmental distance had a less explanatory power than spatial distance, indicating a limited environmental effect on the community phylogenetic structure of grasslands on the Mongolian Plateau. In view of the limited effect of climatic factors on the community phylogenetic structure of grasslands, climate change may have a smaller impact on grassland degradation than previously thought.